I found this post on Pinstrest and was SUPER excited. While I do things to stretch our dryer sheets, I have never tried to make my own fabric softener and dryer sheets. After reading all the recipes they had on Tip Nut I think it will be something I do in the future. They are so simple and easy and If they work, it will be worth the savings! Mix equal parts hair conditioner and water and store in spray bottle. Mist a washcloth or sponge and toss in dryer with wet load. 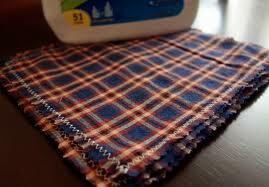 Soak a washcloth in full strength liquid fabric softener. Wring out excess, then lay out to dry first before using–helps prevent staining laundry the first time. To use: toss the dried washcloth in the dryer and use again and again until it no longer works. Resoak when needed (you should be able to do a few dozen dryer loads per soak). Place a pail large enough to hold double the amount of ingredients in the kitchen sink or bathtub. Mix the baking soda and water in the pail, stir till the powder is dissolved. Then add the vinegar. Remember that baking soda and vinegar reacts with fizzing, so use a big pail to account for this. Once it’s stopped fizzing, pour into clean bottles, cap, then use 1/4 cup per rinse cycle. The baking soda won’t be completely dissolved, just shake the bottle to mix the batch up before adding to the rinse cycle. To see the rest of the ideas be sure you check out Tip Nut’s post about it! I don’t find vinegar to be a good replacement for softener, but I have been making my own laundry soap for more than an a decade. It is super simple and cost only pennies.